Our full-time Social Director ensures that there’s never a dull moment for our residents. 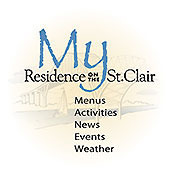 The following are just a few samples of activities that are designed for the enjoyment and stimulation of residents at Residence on the St. Clair. Residents Council – our Residents Council gives residents and their families a say in the social events and the participation of functions at Residence on the St. Clair. Exercises - our programs for balance and fitness take place three mornings a week. In addition, a physiotherapist assistant offers classes two times each week, and one-on-one physiotherapy treatments. Exercises Group Two – three mornings a week, we work as a liaison group from the Health Unit supporting fall preventative classes. Music and Entertainment – we have a dedicated group of musicians who volunteer at the Residence on the St. Clair. Whether it’s a sing-along or entertainment, our residents are delighted by the opportunity for merriment. Continuing Education – we welcome various community groups, such as the Fire Department, Health Unit fall prevention, Heart and Stroke, Alzheimer’s Society, into Residence on the St. Clair to provide presentations on topics of interest. Community Outings – whether visiting our famous chip trucks under the bridge in Sarnia, attending local theatre or taking a drive along the St. Clair River, residents look forward to outings into the community to explore, socialize and feel more connected to the outside world. Crafts –there is always something exciting being created in our activity room including quilts and craft items that are then sold at our Fall Bazaar. Spiritual Gatherings – various churches and fellowship groups in our community take turns providing a weekly Sunday afternoon service for our residents. Gardening – residents are encouraged to practice exercising their green thumbs in our gardens, and nurturing the flowerpots on our back patio.